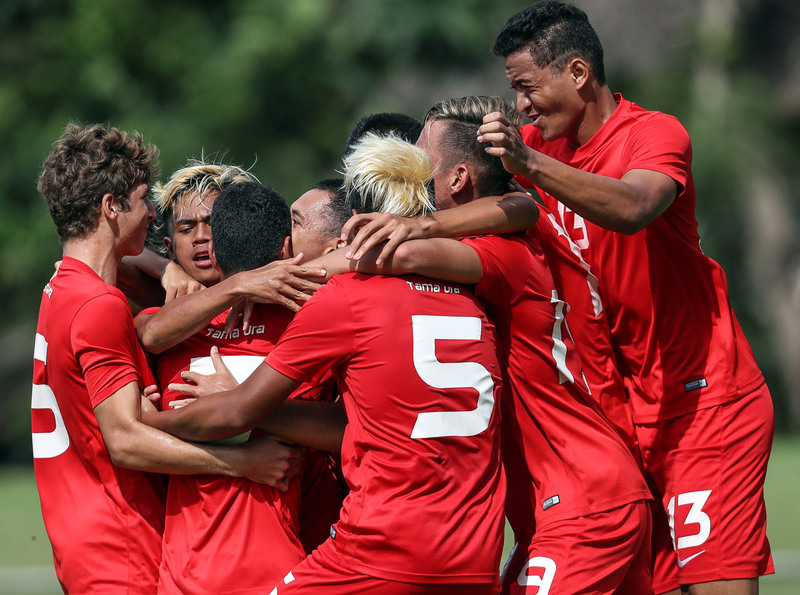 Samoa almost caused a shock upset in the opening Group B match of the OFC U-16 Championship after taking a two goal lead over Fiji at Lawson Tama Stadium this afternoon. However the Fijians fought back in the second half to secure a 3-2 victory over the Qualifier winners before Tahiti beat New Caledonia 2-1 in the day’s late match. The kick-off for the opening match was delayed by two hours following disruptions to the flight arrangements for Samoa, but that barely registered for the side as they settled easily into the encounter. So much so, within the first 10 minutes they’d had more shots than their opponent, and were rewarded with a seventh minute goal courtesy of captain Lotial Mano with an impressive back-heel. Despite sitting deep in their half, Samoa proved lethal with a direct counter attack and were soon leading by two goals after Mano nailed in a second ten minutes later. It seemed a two goal deficit is what Fiji needed to kick start them into action and they were soon starting to play more organised, possession-based football as they sought to pull their opponents back within their reach. The pressure paid off two minutes into added time when Eshan Kumar found the back of the net for Fiji. Fiji continued with that momentum as they came out for the second half as they forced Semu Faimata, the Samoa goalkeeper, into making a number of goal-denying saves. Like the opposing Mano, Fiji captain Josaia Sela then took it upon himself to lead by example firing in a fantastic equaliser in the 63rd minute. He then buried the match in the 78th minute when he gave Fiji the lead from the penalty spot. Fiji coach Yogendra Dutt was delighted his side had the mental strength to not only come from behind to equalise, but to find a match winner too. “As we expected it was tough and we knew Samoa would be physically strong. What we planned initially didn’t work out and it took some time for us to find something that worked,” Dutt said. Samoa coach Martin Tamasese was impressed by the start from his side, although a little disappointed they couldn’t hold onto their hard-earned lead. “I am really happy with the boys today. We did well in the first half but there were a few silly mistakes in the second half that cost us the game,” he said. The second match was expected to be a close race between the two Francophone nations and New Caledonia and Tahiti delivered exactly that in a tightly contested, highly entertaining encounter. Of the two teams it was Tahiti who settled into the match first with and early attack on the New Caledonia goal showing their intent to press high and put pressure on their opponents. Hermann Aurentz’s side also showed great patience too, with the side having taken a few tips from the Barcelona playbook which saw them play back and across the defence as they reset and looked for options. It didn’t take long for that patience to be rewarded when Tekaki Sangue received an excellent cross which he knocked past New Caledonia goalkeeper Raumauld Dalmas with ease to open Tahiti’s account. Neither side shied away from a challenge as they hoped to use their respective physical presence to manage the game. New Caledonia had some decent chances in the first half, one of the best a narrow miss from the head of Luc Pougin. However it wasn’t meant to be and Tahiti retained their one goal lead going into the second half. But even the one goal lead didn’t last particularly long as Denji Kaiha drilled a fine effort into the back of the net less than ten minutes after the restart. Unfortunately for both teams the rivalry between the two nations eventually boiled over and goal scorer Sangue along with New Caledonia substitute William Read were both shown red for their roles in an incident just on the hour mark. New Caledonia started making greater inroads into their opponent’s final third as the second half wore on and they had several near misses before Andre Matha put the finishing touch on an organised advance from the team. The match started to become a little tenser as the clock counted down with New Caledonia showing great determination in their pursuit of an equaliser, while Tahiti remained solid at the back. With eight minutes of additional time New Caledonia threw themselves forward but the frustration at being unable to get the finishing touch they desperately sought soon shone through when Deo Bouanou, who had been quite impressive otherwise, kicked the ball away in frustration which led to a second caution and with it his marching orders. Tahiti coach Hermann Aurentz was very impressed with the performances from both sides as they showed the rivalry between the two nations continues. “The Cagous were right there in the match impeding our game, and the heat as well meant it was very tough out there,” Aurentz said. Aurentz said today’s win is the best way for his side to have started this competition. “It’s never easy to play against New Caledonia and in recent years it’s been difficult to get a win against them – today we did. New Caledonia coach Leon Waitonyie was relatively upbeat despite the defeat and the loss of two players for their next encounter. “We could say we played well but the essential thing was to win so we missed out on a bit of luck,” he said. Waitronyie believes the pressure of a first international tournament was a bit overwhelming for his side.